Summer days are for living. For getting out in the sunshine and living life to the full. Our summers in Britain are too short to be sat around waiting and that even comes down to our skincare. I certainly haven’t got time for dull, lack lustre skin. I need something in my life thats going to brighten and give my skin its radiance back; fast. 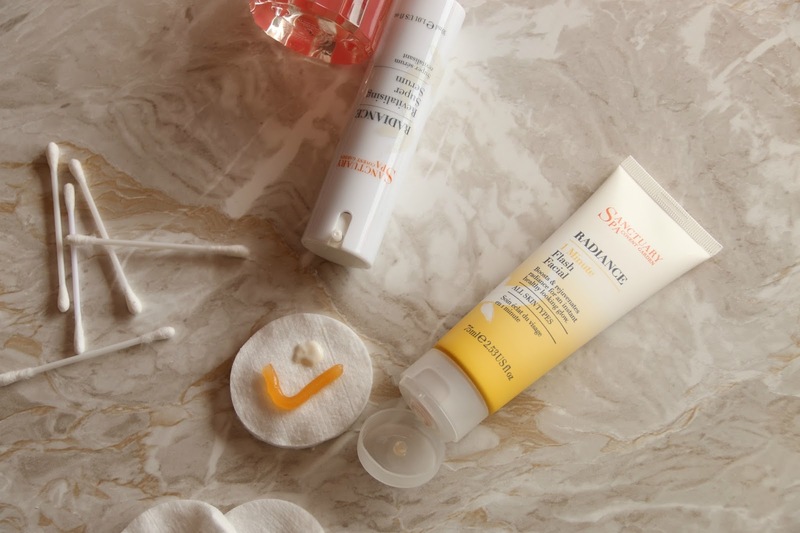 I’ve found the perfect brightening skincare combo from the Sanctuary Spa with the two new products that they’ve just released into their Radiance line. Want to hear all about them? When you want to quickly perk your skin up, leaving it looking brighter and refined, you need the Sanctuary Spa 1 Minute Flash Facial. This is a whipped gel face mask thats packed full of three different kinds of Vitamin C, including the world’s highest source of Vitamin C, the superfruit Kakadu Plum. To use it, simply smooth onto clean skin and leave for 1 minute before washing off with warm water and a face cloth. The mask gets to work within seconds of it being applied and I can feel my skin gently tingle while its working. This isn’t irritating at all and the beautiful scent of the mask is quite zingy and uplifting too which makes for a great pick me up treatment. The 1 Minute Flash Facial fragrance is quite citrusy; its scented with orange, lemon, geranium and frankincense essential oils and also rosemary which is a known antioxidant when used in skincare. What I love about this mask is that it works quickly. If my skin is looking lack lustre in the morning then I can pop this mask on while I brush my teeth, wash it off an my skin looks so much more radiant, smooth and glowing. Its as if the mask retextures the skin to brighten it. Either way, it certainly gives my skin a healthy, summer glow, especially when used with the Revitalising Super Serum. When my skin is looking dull, I smooth on a couple of pumps of the Sanctuary Spa Revitalising Super Serum and it instantly looks brightened and smoother. This serum is one thats designed to be used morning, evening or both, alone or underneath a moisturiser. I prefer to use it AM. It contains Vitamin E, hydrating Grapeseed Oil, multi-active Vitamin B3 and the brightening extract from the Kakadu Plum which is the same ingredient that is in the 1 Minute Flash Facial. Its designed to make the skin look brighter, fresher and smoother from the first use which it absolutely does. My skin looks perfected after using this serum and because its so hydrating yet so light, I tend to apply it and then skip my moisturiser because I don’t feel as though its needed after using this. It sinks into the skin really well and is lovely to apply makeup on top of if I’m painting my face on that day. If not, then I feel totally confident going out without makeup on as this serum does make my skin look and feel lovely; so bright and youthful. Over time, this serum claims to boost the skins hydration and radiance which I’ve already felt the benefit of, as well as refining the texture and giving the skin a healthy glow, which I’ve found too. With longer use, it helps to reduce the appearance of dark spots and pigmentation, leaving the skin glowing and looking revitalised and refreshed. While I don’t have any dark spots or pigmentation issues, I definitely think its important to mention its claims as its a really affordable serum and could help a lot of people out there! For perking up the skin, these two radiance boosting products work well on their own but together, they’re a total dream team! 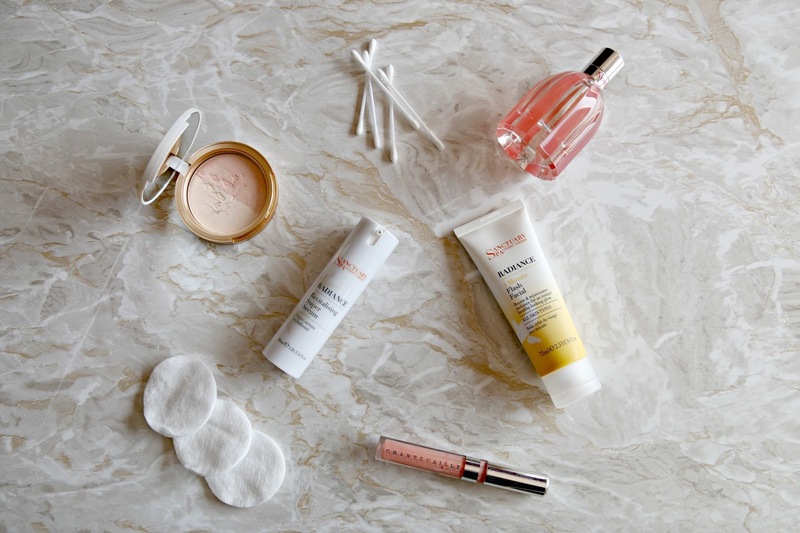 What products do you use to give your skin a boost of radiance? Sanctuary are one of my favourite brands; such a great way to add a little indulgence into your day! Love Sanctuary items and the spa range they have so many good products to offer. Love the sound of these two products, especially the serum. Time to treat the skin! I love sanctuary spa products and that one minute mask sounds great! Sounds like super products. I really ought to up my own beauty regime and get things like this. I need a one minute facial – my skin is so dry at the moment. I love a radiant glow on my face and my serum has just run out – good timing! I wouldn't mind trying that lovely serum. That sounds so nice, and my skin could use the moisture! These sound amazing, I haven't tried anything from them before, maybe I need to now! I like the sound of these products. Need to try them. I love Sanctuary products; I took some minis with me on my recent trip to Portugal. Haven't checked out the skincare range yet though.